When I built my new computer back in July, I reused my trusty old LianLi PC60 case I had sitting in my attic, which despite being 10 years old now, is still an AWESOME case. Very classy looking, and very lightweight. However, with only provisions for 80mm fans. It's kind of hard to get some decent cooling out of it without sounding like you are sitting next to a F-16 on takeoff. Plus, with some minor overclocking of my PII 965BE on the stock AMD cooler, I was reaching within 2 degrees Celsius of the maximum safe processor temperature speced by AMD. Not cool, by stretch of the means. Obviously, I needed a better case and a better CPU cooler if I didn't want to fry my new machine. Plus, I had crammed the LianLi full with 5 hard drives, I didn't have any room for future expansion. Corsair H50 and H70 seemed a little cheesy, they yielded decent results, but some of the best air coolers yielded similar results as well. Don't get me wrong, for "water cooling" they are cheap enough, but they aren't upgradeable, and being a sealed system poses some drawbacks IMO. And since I wanted low noise and good performance because I want to be able to get a decent overclock out of my new rig, a true water cooled setup seemed like the way to go. Finding the perfect case took forever. 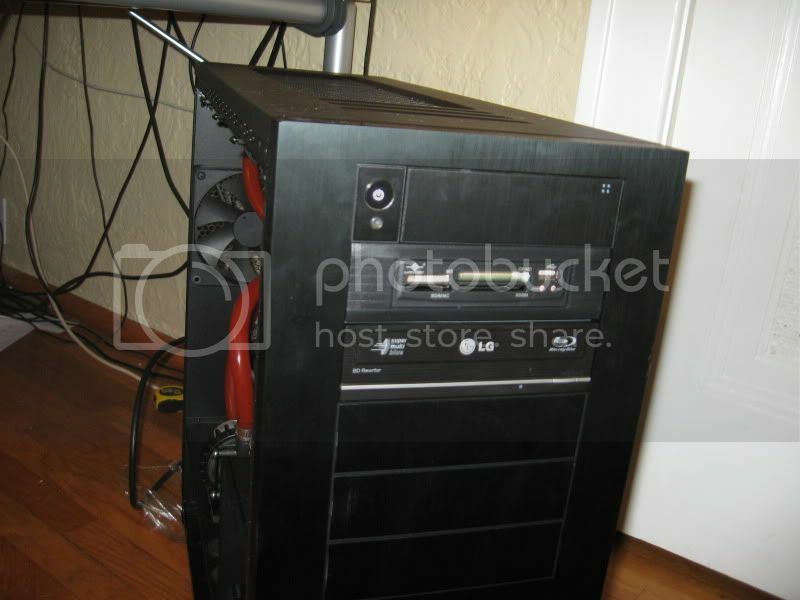 I searched newegg for a while, went to the local Microcenter and determined that all cases for the most part nowadays, are freaking ugly, or a sea of cheap plastic. The only things I saw that looked decent were the cases from Corsair, the upcoming 600T, the 700D, and the 800D. The 800D I ruled out because dropping 3 bills for a case is just insane. The 600T is still a month or so away from being available, and I just couldn't live with the screaming jet next to my ear any longer. Thankfully, newegg had the 700D on sale with free shipping for $140 after MIR, which was more bearable than the normal $200. Also picked up a OCZ Agility 60gb SSD at the time, since it was also on sale for $100 along with a 3ware hardware raid controller so I could get rid of using the fakeraid on my mobo and free up some system resources. Doing raid5 off the mobo, you get some pretty horrid windows boot times I found out. I decided against watercooling my 5770 for now as I might upgrade to something better when the 6xxx cards come out here later this year, and I'm not overclocking it anyways. For my loop I picked up a Swiftech MCP655 pump, a Swiftech MCR320 radiator, and a EK-Supreme HF waterblock. 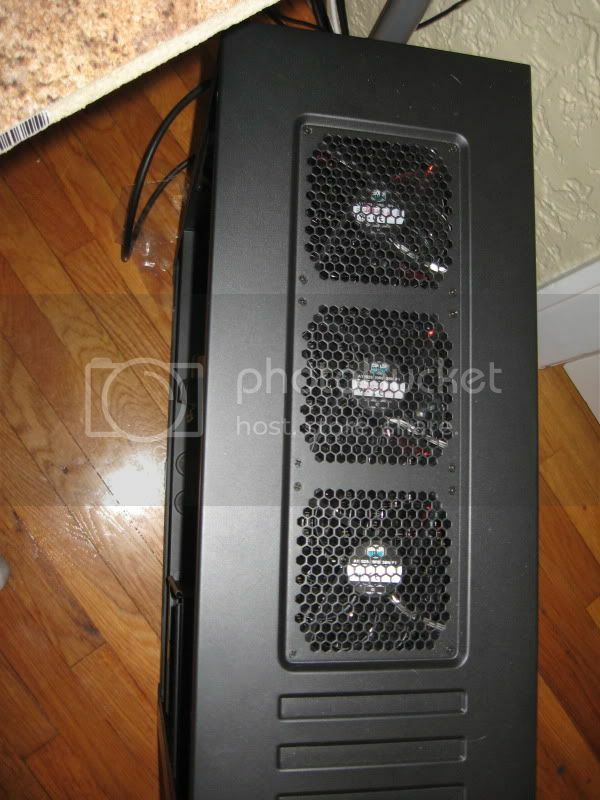 I kind of went overkill with the fans on the radiator, I got 3 on the top pulling air thru the radiator and out the top of the case, and another 3 on the bottom pushing air into the radiator. Bought 7 of those fans in total, added another to the bottom to cool my new 60gb SSD OS drive, and my 750gb programs drive. After getting it all swapped into the new case and leak testing the loop overnight, it was time to install windows on the SSD and start torture testing it with some Prime95. About the SSD and going to a true hardware raid setup for all my data, WOW. Huge difference there. I cut the boot times down 75%. From pressing the power button, I'm sitting the login screen in 12 seconds, versus nearly a minute. Not only that, but I'm getting sustained writes on the array at 35mbs. Which isn't shabby at all for some 5900rpm drives. After sitting for 5 hours with the Prime95 torture test maxing out all 4 cores of the CPU, My processor is only running at 36C(95F), which is only about 20F more than the ambient temperature of my room. That's INSANE. At idle, it sits around 10 degrees warmer than the ambient temp. Of course, this is all at the stock clock speeds, I'm sure once I start overclocking it again, it will jump up there a bit. Thats cool, nice case and setup. 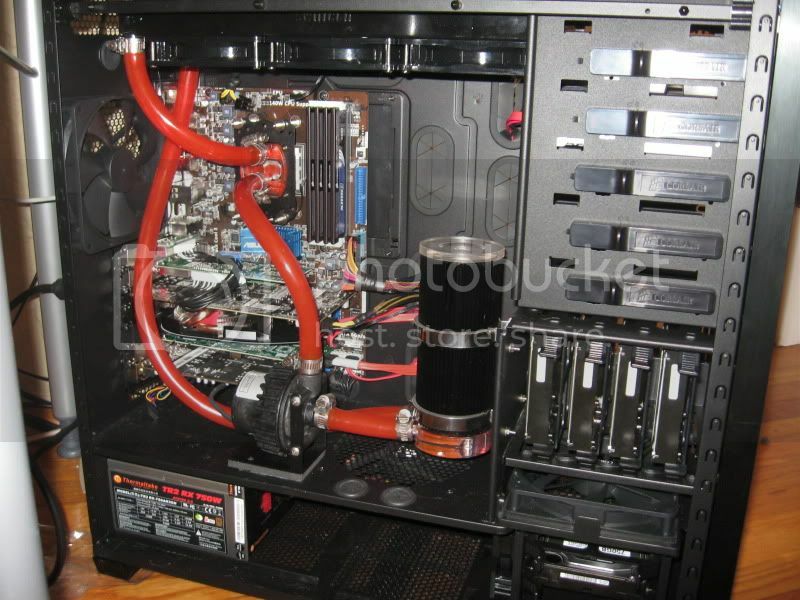 Water cooling is something I've never tried.... might have to try it one day.